Repulsion Gel is a light blue substance that repels objects, and any player or object that hits a surface coated with Replusion Gel will bounce off. Jumping off such a surface launches the player higher than a normal jump, and the height of the jump is proportional to the distance a player falls before rebounding from the Gel. This allows the player to reach higher ledges and platforms by falling from a greater height. When used in combination of Propulsion Gel, the player can travel a considerable distance, which is vital in situations in which Portals cannot be used. Objects such as Storage Cubes and Turrets can be covered in Repulsion Gel, which causes them to bounce around erratically. Crouching will negate the effects of Repulsion Gel, and is useful for situations in which players find it difficult to stop bouncing and require more control over their movements. Repulsion Gel can be applied to virtually any surface, and can be placed in different locations through the use of carefully-placed portals. The Gel is most useful when applied to surfaces at the bottom of pits, at the edges of large gaps, or to closely-spaced parallel walls, which allows the player to move between them by bouncing from one to the other. The Gel is primarily used to circumvent large gaps, and/or cover considerable distances. 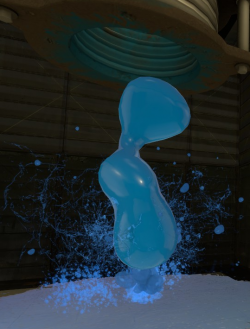 Aperture's first attempt at a dietetic pudding substitute resulted in Repulsion Gel, a much sweeter, slightly less non-toxic form of fiberglass insulation that caused subsequently-ingested food items to bounce off the lining of the dieter's distended stomach and out his or her mouth. For various reasons, this product also was pulled from the shelves. The Repulsion Gel was based off of the green paint from Tag: The Power of Paint, which functioned in a similar fashion. Despite repeated warnings, being covered in Repulsion Gel will not cause any harm to the player, apart from briefly obstructing their vision. This page was last modified on 12 December 2015, at 02:55.